Welcome to thediamondcuts.com - a web site dedicated to providing detailed information and original research on the numerous diamond cuts that have been used since ancient times. From the ancient and "primitive" point cut of the 14th century to the ultra-precise computer-designed modern brilliants, many of the most popular antique and modern diamond cuts have their own dedicated page on this site. Note that the word cut should be used to refer to the quality of the diamond cutter's work. It is one of the "four C's" - cut, carat, clarity, color - which are used to evaluate the quality and market price of a diamond. However this can be slightly confusing as the various shapes / styles into which diamonds are fashioned are also called diamond cuts by most people, rather than diamond shapes - hence the naming of this site. This site features a special section on antique diamond cuts and we're pleased to announce that by digging through the "dusty vaults" of online libraries, we were able to overturn a few urban legends and copy-pasted internet rumours! 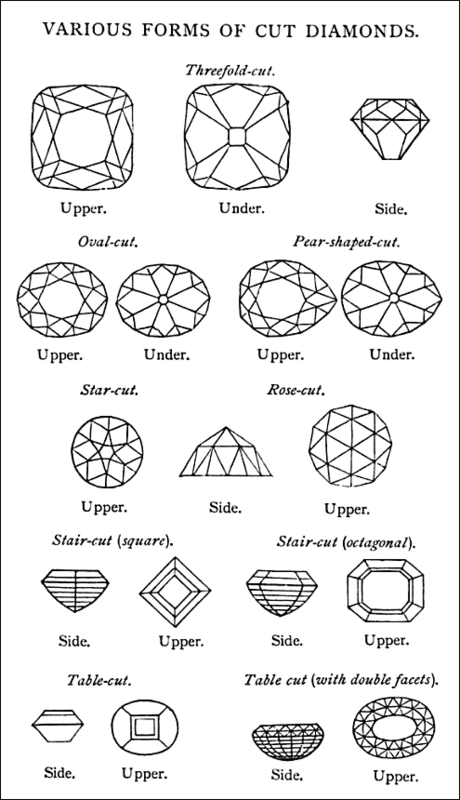 Drawing of antique Diamond Cuts from Alexander Japp's 1889 "Days With Industrials". Round Diamond Engagement Ring - amazing pics. Note - this website is intended for general informational and entertainment purposes, and should not be considered to be professional consultation. The owner of this website is not a diamond dealer. If you are considering purchasing precious stones, be sure to seek the advice of a qualified professional.